Entry fee of $5.00 gains admission to the show and sale as well as the authentic Japanese stroll garden with a lake, stone lanterns and other features. 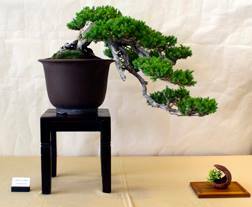 There will be sale tables with bonsai and bonsai related materials and a demonstration on Sun. at 1PM.